The colorful and theatrical former First Lady Imelda Romualdez Marcos—domineering, rhetorical, cunning, eloquent, smitten, and off her rocker, greedily takes the stage in this hypothetical play by transgressive Filipino writer Peter Solis Nery. The powerful figures of Ninoy Aquino, Cardinal Sin, Ferdinand Marcos, and her lovers become merely stick figures, almost theatrical props, against Imelda’s monstrous presence on stage as we closely watch history as a parade of actors, wannabes, and losers. The drama builds up, not on ground level, but in every character’s personal heaven. But wait, there’s more: even in the “afterlife,” Imelda gets to have it her way—she flits from one man’s heaven to another, in a cathartic “apparition” of some sort to purge herself of guilt, or play cute and philosophize her way out of it. This is Imelda who is halfway between remorse and disbelief, but is fully consumed by the latter in the end. She isn’t sorry for what had happened—never—because everything will never measure up to pure art anyway. The play doesn’t fall short on what’s “real and what’s imagined” in Imelda’s mind. Dead or alive, she has no way of drawing the line between the two. But, the supreme irony is that, in this metaphysical play, the Imelda who conceived the Cultural Center of the Philippines and dreamed up a vision of bringing “the true, the good and the beautiful” into a country that had mostly dreams for meals everyday, has done herself justice. 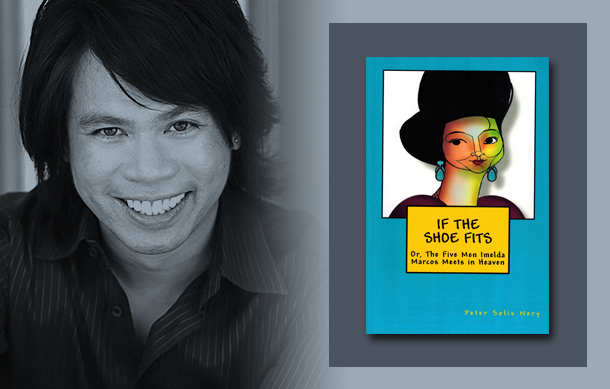 Peter Solis Nery’s Palanca Award-winning play “If the Shoe Fits” is a character study, plus a sprinkling of gestalt and pop psychology, that generously adds on to the Imelda Marcos lore.